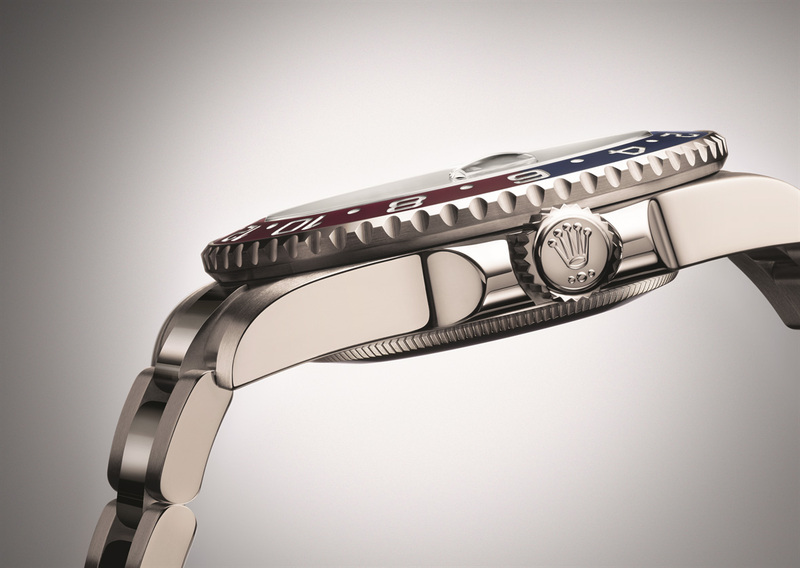 After years of anticipation Rolex has finally revealed the GMT-Master II with a Cerachrom bezel in red and blue, with a white gold case and bracelet, returning the classic “Pepsi” GMT-Master to the fold. 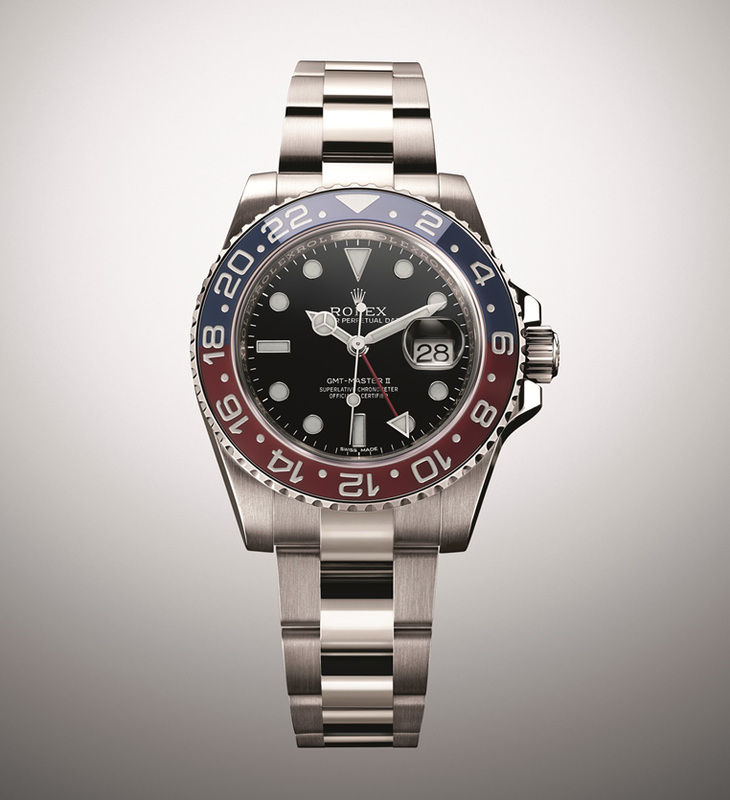 Red and blue has long been the quintessential bezel for the Rolex GMT-Master, especially since the 1955 original was in those colours. 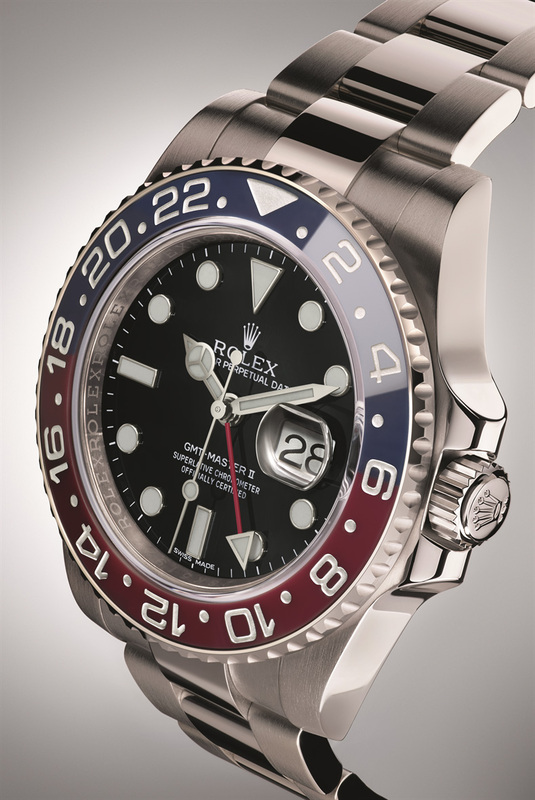 With the discontinuation of the aluminium insert bezel models in 2005, the two-tone GMT bezel was gone. 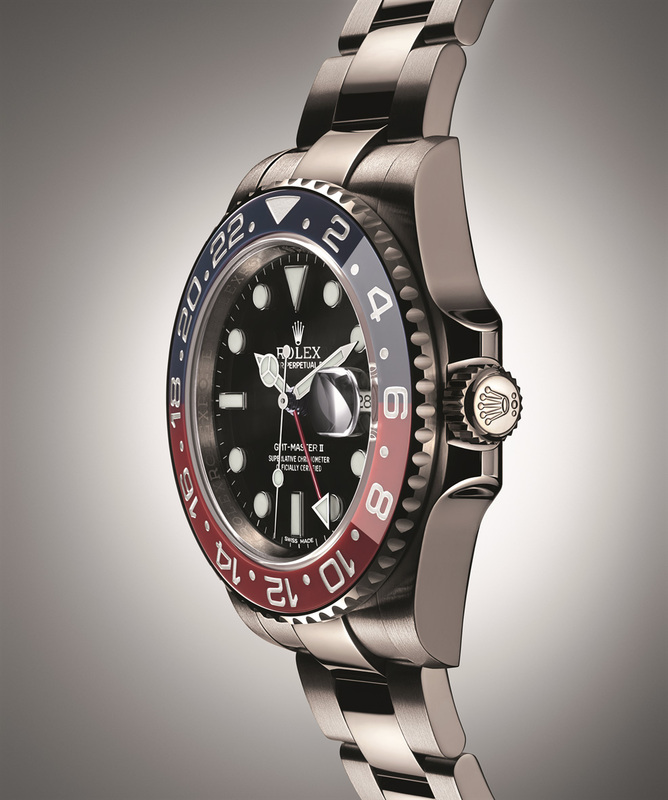 But last year’s blue and black GMT-Master II in steel – the first ever two-colour ceramic bezel – raised hopes that the “Pepsi” bezel would be revived, and those hopes have been fulfilled with the premiere of the new GMT-Master II (Ref. 116719 BLRO) in white gold at Baselworld 2014. Bright colours are difficult to achieve in ceramic, which is why most ceramic in watchmaking is black. 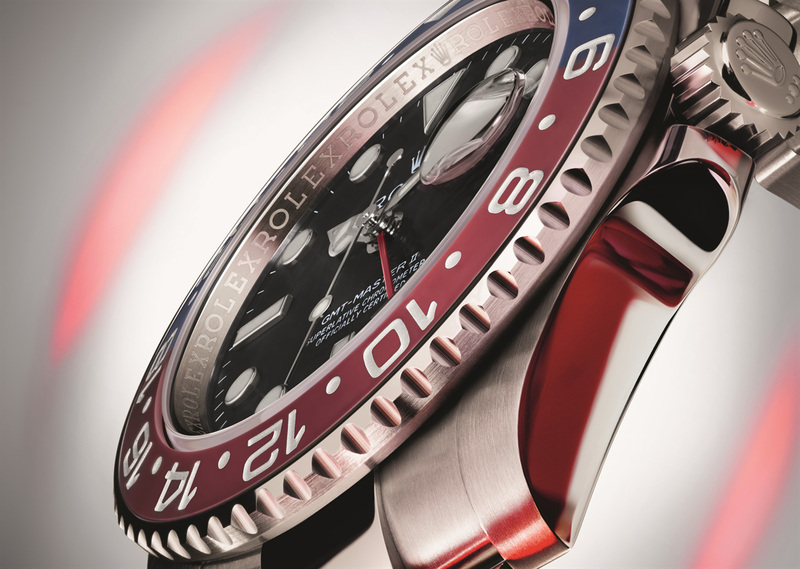 The new GMT-Master II has a single-piece ceramic bezel insert in red and blue, which actually starts out entirely red. The bezel blank is first injection moulded, then baked, leaving a red bezel. A chemical agent is then applied to half the bezel, which absorbs it since the ceramic is still porous at this stage. This chemical compound causes the treated half of the bezel to turn blue during the next step, which is sintering, or baking at 1600 °C. Sintering hardens the bezel, shrinking it by a quarter. Next the bezel is machined to give it the necessary shape and engraved numerals. That is followed with coating the bezel with a thin layer of platinum via physical vapour deposition (PVD). The final step is polishing off the excess platinum coating, leaving only the platinum inside the numerals, which gives them their silvery tone. The new GMT-Master II has a 40 mm white gold case and matching white gold bracelet, all of which are identical in form and function to the existing GMT-Master models. Inside is the cal. 3186 movement, which has an independently adjustable second time zone hand which moves in one hour increments. 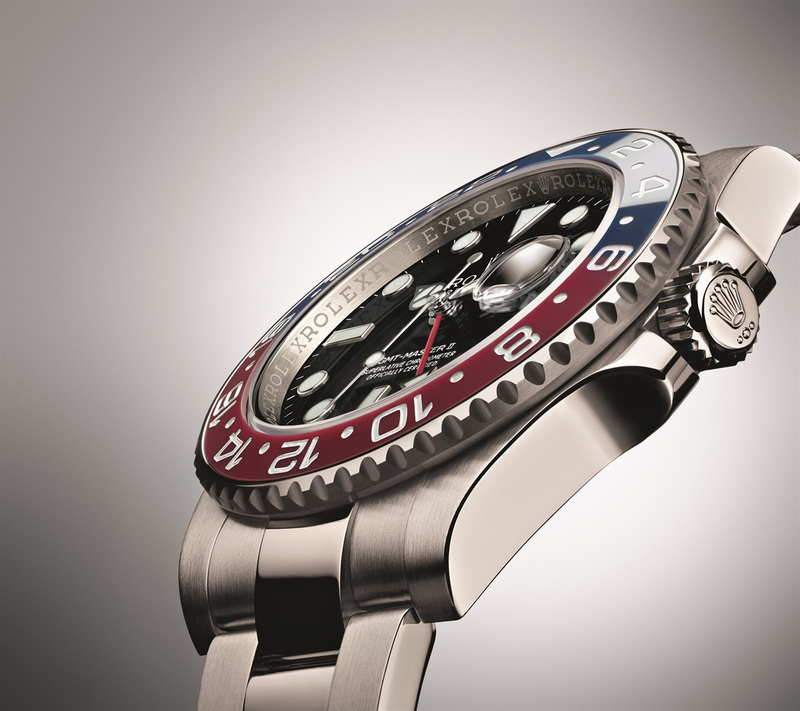 The GMT-Master II “Pepsi” will retail for 36,500 Swiss francs, which is about US$41,200.